One of the most troublesome high-tech news stories to linger in the media is the way that high-tech workers are treated in China. 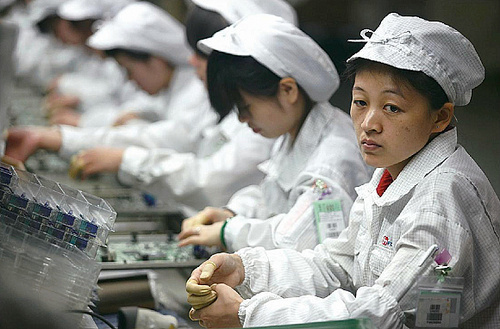 Foxconn, who employs a million workers in China building the iPhone and many other consumer electronic devices, has repeatedly come under file for creating working conditions that would be criminal in this country. Among the allegations are hiring children as young as 12 and paying them 70 cents per hour, enforcing 14-16 hour days hours in spartan and often dangerous conditions, and injuring or even crippling workers through non-existent safety practices and then simply firing them without paying for their medical treatment. The conditions are so bad that suicides are not infrequent (a problem that the company addressed by installing nets beneath the taller buildings). In case you haven’t been following the story, there’s good coverage in Business Insider. Every time a new allegation emerges, iPhone users wag their fingers at Apple and threaten a boycott unless something is done. Apple responds by sending someone to investigate, and they return with stories of frank conversations with management, improving conditions and promises to do better. But the reality is that we, as citizens of the first world, cannot improve the working conditions in other countries, and shouldn’t. In the short run, our interference can only make the conditions worse. Working conditions in China’s factories today are little different from the conditions during the early Industrial Revolution in Great Britain and the U.S. Then, eight year old children routinely worked 14-hour shifts for the equivalent of fifty cents in today’s money, although adult men might do considerably better, making $2.50/day (adjusted). Still, people flocked to the factories and stood in long lines for hours for the chance of employment. Why? Because these jobs, grim as they were, represented their best option. It was better to be a slave than to be a beggar or starve to death. Child labor had never been a subject of controversy in a world dominated by agricultural and handcraft economies. Children always worked on family farms and boys as young as 10 were apprenticed to their crafts. As a result, improvement came slowly. In 1833, the controversial Factory Act passed by British Parliament. Under this enlightened law, children 9-13 years of age were only allowed to work 8 hours a day and those 14-18 years of age could not work more than 12 hours. By 1899, about half the states had passed laws regulating child labor, but these were almost never enforced. In 1912, after a 9-year battle, activists in the U.S. forced the government to establish the Children’s Bureau to monitor child labor, but it wasn’t until 1938 and the Fair Labor Standards Act that the Federal government finally regulated the minimum ages of employment and hours of work for children. These changes in working conditions could not have come about without the rise of an educated middle class, without the development of modern social and government institutions, and the improvements in the standard of living which were the benefits of industrialization itself. There is no short-circuit. Just as a child needs to grow through those awkward teenage years in order to develop the skills required to take on adult responsibility, a society needs to suffer the growing pains which lead to the development of institutions and an enlightened population. Our outrage at the labor practices in China (or Nike paying teenagers $2.17/day to make sneakers in Jakarta) only serves to pressure companies to take those jobs elsewhere, removing the engine that was providing the possibility for economic and social growth. Higher salaries only fuel the type of rampant inflation that destroys local economies and breeds crime. For proof, we need look no farther than any modern tourist destination. Fair trade programs, the darlings of the coffee, chocolate and handcraft industry, have fared poorly as well. While making American consumers feel good about buying foreign products, they have done little to help local farmers and may have even hurt them by creating an addiction to US markets and acting as a disincentive to the modernization and mechanization which could provide real and lasting benefit. Americans need to come to grips with the fact that we really do not know what is best for the whole world. The factory jobs at Foxconn, as dismal as they may seem to us, are far superior to slaving in a rice paddy all day and represent real opportunity for the Chinese people, especially the women. So go ahead and enjoy your iPhone and your other toys. You are providing real economic opportunity to developing countries who, like us, will one day enjoy a standard of living that prices them right out of the global labor market. It just won’t happen overnight.